Why you can't miss the Crazy Horse Memorial. While Mt. Rushmore might be the most famous tourist site in the Black Hills, the Crazy Horse Memorial, just 17 miles away, is another must-see destination that shouldn’t be overlooked. This massive mountain carving is a testament to the heroes and culture of Native Americans and will leave visitors amazed by the sheer scope of the project. Crazy Horse Memorial is in the Black Hills just east of US-385/US-16 between Rapid City (60 miles away) and Casper, South Dakota (6 miles away). The Rapid City Regional Airport, about a one hour drive from Crazy Horse Memorial, has flights from Las Vegas, Phoenix, Salt Lake City, Denver, Minnesota/Saint Paul and Chicago. Because the Crazy Horse Memorial is a non-profit organization that receives no government funding, it is dependent solely on entrance fees and donations, part of the reason that the finish date is unknown. Pets are allowed at the Crazy Horse Memorial, but must be kept on leashes at all times. Pets are not allowed on the mountain shuttle. The Crazy Horse Memorial was begun in 1948 by Chief Henry Standing Bear of the Lakota Tribe and sculptor Korczak Ziolkowski, who also worked on the Mt. Rushmore Memorial. Over sixty years later, the monument is still a work in progress. When it is finished, the Memorial will picture Lakota leader Crazy Horse sitting astride a horse with one of his arms outstretched and will be the world’s largest mountain sculpture, standing 641 feet wide and 563 feet high. For comparison, the head of Crazy Horse is even larger than the presidential heads on Mount Rushmore. Crazy Horse was a famous Lakota warrior and leader during the 1860s and ‘70s. After participating in and leading several battles in defense of the Lakota philosophy and way of life, he was killed while surrendering to the United States. 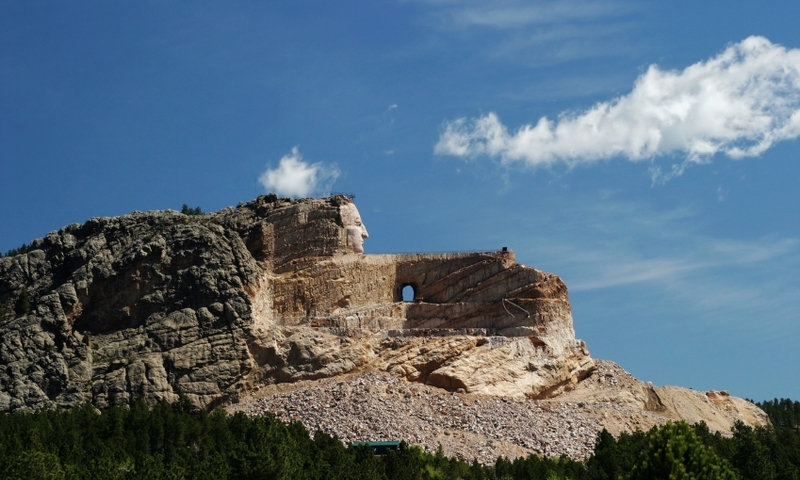 Once finished, the memorial will honor the spirit of Crazy Horse’s beliefs and culture. Although there is no set date for the project to be completed, visitors often return year after year to watch the progress of the carving, which is done by using explosives to blast away areas of rock. While the Crazy Horse Memorial has garnered support from many people, there are some groups that maintain that the memorial itself has gone astray and that carving a mountain into a statue goes against the beliefs of Crazy Horse and many native peoples. While hiking up to the site of the memorial is limited to the annual Volksmarch in June, visitors during other parts of the year won’t find any lack of activities. The Welcome Center houses a brief introductory video to the memorial that’s a must-see. After the video, be sure to tour the Indian Museum of North America and the Native American Cultural Center, where you can see exhibits that house Native American artifacts, see modern Native American art, play traditional Lakota games, attend educational presentations, create your own Lakota instruments and crafts and more. After you’ve built your hand drum and put up a teepee, stop by Korczak’s Studio and Home to learn more about the sculptor and his art. Crazy Horse Volksmarch (first weekend in June) – The “most popular organized hike in the United States,” the Crazy Horse Volksmarch is a 10k hike through the Black Hills woodlands up to the arm. This is the only time that the public can hike to the carving site, so be sure to take advantage. Stampede Rodeo (mid-June) – The Stampede Rodeo is a rip-roarin’ good time, with events from both the Professional Rodeo Cowboy’s Association and the Great Plains Indian Rodeo Association. Between bull riding and bronco busting browse through authentic Native American and Western arts and crafts on display. Night Blasts (June 26 and September 6) – One of the most popular events at the Crazy Horse Memorial, the Night Blasts are similar to a 4th of July fireworks show, just better. Come join the party and watch the mountain light up with fireballs and pyrotechnics. Native American Day (October 9) – Each year as South Dakota celebrates Native American Day, visitors to the Crazy Horse Memorial can enjoy traditional Native American art, dance, song and food while learning about Native American culture.